Berlinica Publishing LLC, 9781935902447, 176pp. 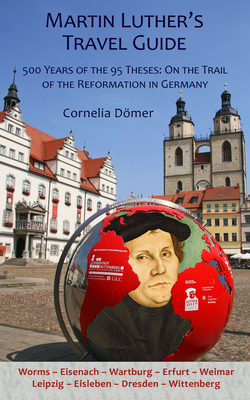 Offering a chance to visit key places connected to Martin Luther, this guide brings readers to each town, castle, and church where the famed German preached, spoke, or fought. Travelers will find information on the historic towns of Dresden, Eisleben, Erfurt, Gotha, Leipzig, Lutherstadt Wittenberg, Weimar, and Worms. The book also includes stories about Luther's life and work as well as maps, timelines, full color pictures, hotel and restaurant recommendations, addresses, phone numbers, and websites. Fascinating and insightful, this guide will not only help travelers prepare for their trip but will also present facts and information on each historical site. Cornelia Domer, PhD, serves as a representative for the State of Rheinland-Pfalz at the federal German level and with the European Union. From 2000 to 2007, she managed the Luther-Zentrum Wittenberg. Previously, she was responsible for culture and marketing Luther at the Sachsen Anhalt GmbH, and e.V. She studied English and Romance language and literature, geography, and received postdoctoral certification at Cologne in 1992. Robert Kolb is a professor of systematic theology emeritus at Concordia Seminary, Saint Louis, member of the Continuation Committee of the International Congress on Luther Research since 1993. and former associate and co-editor of The Sixteenth Century Journal. He is the author of Martin Luther and the Enduring Word of God (2016), Luther and the Stories of God (2012), Martin Luther, Confessor of the Faith (2009) and some twenty other studies of Reformation History.